I heard this so many times that I developed a rehearsed retort: I used to say, “So am I.” This disarmed them momentarily and they listened for a few seconds of the physics of skydiving and depth perception and motion, and how it’s not even related and how many skydivers are afraid of heights and… whatever. Boring. After a while, I even bored myself when I spit out that pat response. So I tried to mix it up and reply, “I’m not afraid of heights, but I am afraid of widths!” That attempt at humor went right past most people. Sometimes, we attach ourselves to an idea. Other times, we attach an idea to ourselves. Either way, it is not the idea that causes difficulty: it’s the attachment. that might happen if you fail. if the possibility of falling came to fruition. It’s more about fear of the unknown than of anything else. This fear seems to be universal: most children are afraid of the dark. Have you ever tried to convince a child there is no reason to be afraid? No amount of convincing argument or distracting games or even real evidence to the contrary will sway our position. We are attached to that fear. The fear of the unknown is not only a natural, instinctual trait of all humans, it possibly has some evolutionary benefit for self preservation. The instinctual possible reactions to fear are fight, flight, or freeze. Our ancestors probably survived by applying an appropriate one of these reactions in enough situations so that we are here today. Each reaction has its own particular benefit. However, when that instinctual reaction to fear inhibits us from realizing our goals, we have power to use our higher reasoning abilities to function despite our fear. Unlocking this power lies mostly in being aware of our fear, accepting it, then focusing on goals despite the fear. It’s actually not that difficult. It happens when we decide. We simply decide it WILL happen a particular way. We decide to let go of the idea that inhibits us from reaching our goals. We may limit ourselves by accepting a quality about ourselves that is based in fallacy. Another attachment that presents us with similar obstacles in the way of our goals is assigning a quality to ourselves. We each define ourselves in order to fit ourselves into a category. It can be comforting to name and label, as it makes us think we understand complicated things better. The reality is, our thoughts and ideas and desires are very complex and sometimes incongruent, sometimes even in direct conflict. Yet the beautiful balance of life is that we are capable of being flexible and adaptable while still maintaining consistency and security. These concepts are not opposites: they are colors that can blend together in several layers. In an attempt to define ourselves, we label and then try to make our lives fit that label, even if it doesn’t make sense or blocks our path towards what we want. Most of this labeling and inhibiting is unconscious. If we become aware that we are attaching an unhelpful idea to ourselves, we take the first step towards freeing ourselves and opening up many more opportunities. I see this many times with grandparents, parents, or even teachers dealing with children. “Johnny is so smart in math!” And if Johnny hears this enough, attaches that idea to himself, he will become good in math. Unfortunately, it can work towards the negative as well. Especially kids--as they grow and define themselves--use the expectations of others as labels. In our case here in this example, the label is “I am afraid of heights.” Contrary to what I used to think, this is not an excuse. It is simply a label. It is a fact that most people, when in a situation that has danger, will feel fear. It is a fact that scaling heights is dangerous and has a potential of injury. It is a fact that most innate situations that can cause injury create an element of fear instinctually as a useful tool for self preservation. However, the piece of this that we can get stuck in, is that we define ourselves for all situations by one instance. We apply a generic response to a wide range of situations unconsciously. What if we let go of these preconceptions and accept that we might not be afraid in some situations? What if we accept that we are skillful, or good, or okay, or even powerful? What if we accept that we can feel fear but still act based on our will? It’s interesting how we might define how much we struggle as directly proportional to how successful we are. What if we let go of these labels? Is there anything worse than fear? I think so. The extremes on both ends: the fear of feeling fear and the absence of fear. Fear of feeling fear... Like President Franklin Roosevelt put so succinctly, “All we have to fear is fear itself.” It is a mirror inside a mirror, never ending and full of misperception, misdirection. Some people waste so much energy on avoiding fear, fearing fear, they do not have time to realize it is not working. What are the risks we accept unaware, without thinking? Being aware and making choices about the risks that we see is Risk Assessment. Some people use the misnomer “risk management” but this implies control over these risks. We cannot control them. We can only become aware, then decide if the benefit we would gain outweighs the possibility of undesired consequence. A traditional yet ineffective approach is to use time and energy identifying a couple risk factors, then contriving ways to struggle against an existing risk. However, a possibly better use of resources might be to increase our awareness, relax to the situation around us and see what exists. Open up to see as many truths about it as can be perceived. Then determine if the benefits make taking that risk worth it. Balance. The flip side to debilitating fear is the complete lack of fear! Absence of fear is not bravery; it’s choosing to ignore helpful information. Listening to fears can be helpful since fear is designed instinctually to save our butts! Those extreme adventurists who claim “NO FEAR” don’t impress me. Caution is not cowardice. Lack of fear is not courage. Real courage is doing what you need to do to accomplish your goal despite your fear. 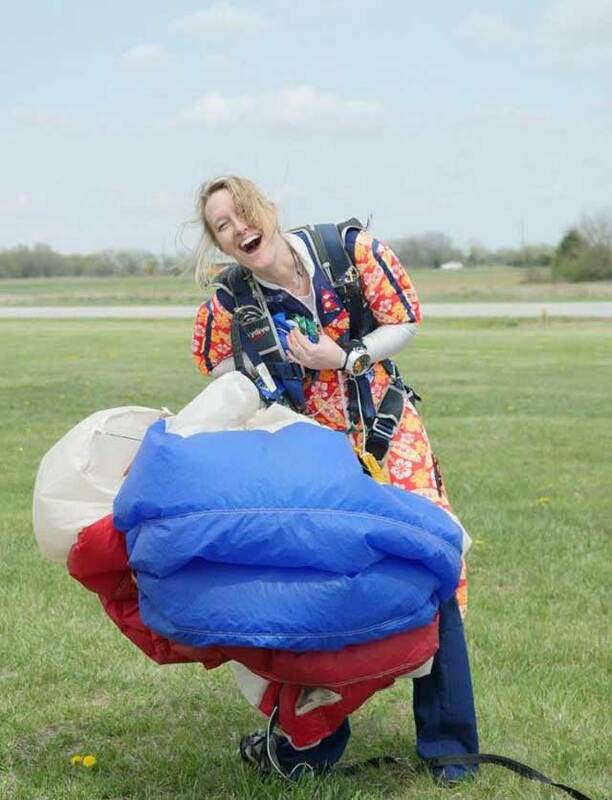 The reality is, I must admit it: I myself am actually “afraid of heights.” This sounds ridiculous coming from someone who has made over 2,300 skydives, jumping almost continuously for two decades. But it’s true. As young as third grade, I remember climbing trees in the library park of the small town where I grew up. As long as I was climbing up those trees and doing something active, I was having a lot of fun. Yet invariably, I would reach a limit and find myself sitting, deciding I could climb no further. It was always then that I realized how high I was. I would look down and fear would overcome me. Fear of not knowing if I could find a way down, fear of falling through the branches and experiencing pain… It would immobilize me, albeit temporarily. When I was in high school, we visited the St. Louis Arch, riding all the way to the top of this incredible edifice. In the elevator, I felt very vulnerable and “along for the ride.” When we finally reached the viewing area at the top, I could feel the wind move the entire structure. I could look out and see how fragile this building was. I could see a great distance and felt very small and powerless. I had nothing to “do” hence my fear was very prominent in my attention. While others peered over the sides and enjoyed the view, I felt more comfortable standing in the middle and divert my focus to watching the people. I pretended to myself I wasn’t actually in that precarious position at that height. So, how can I skydive if I’m afraid of heights? 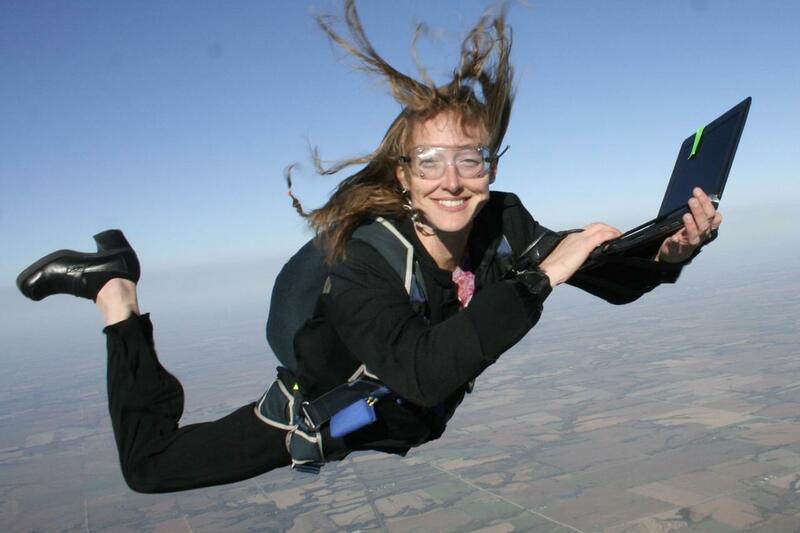 Here’s the difference: on a skydive, I have something to do, a task to focus on instead of my fear. I have to control my parachute and land safely. I have something active to do instead of passively focusing on my fear. Anytime in my non-skydiving life I find myself experiencing unwarranted or disproportionate fear, I strive to discover, WHAT if anything, can I actively do so my fear, while still present, fades more into the background. 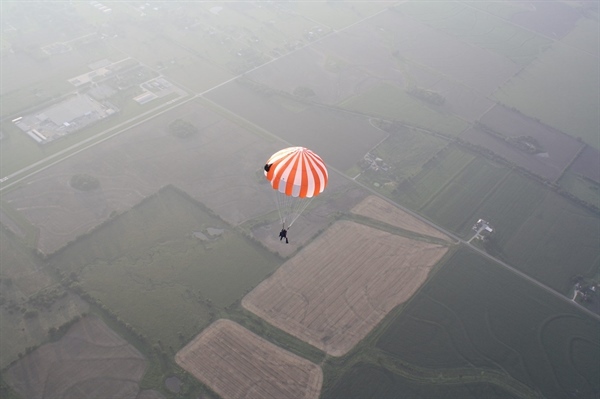 Why would anyone jump out of a perfectly good airplane? Why put ourselves into a position of danger anyway? Why do we place ourselves into situations that can cause us fear? Why are we attracted to scary movies? Why do we seek out experiences like this? Why do we pursue the unknown? Possibly some could argue that we discover and choose the emotion or adrenaline that these situations create. Or, you could argue we are born with the adventurous spirit. How else would any of us as babies venture out to start walking? The unknown can give us so much potential of the unexplored. Is it our individual destiny to balance inside us the dichotomy of fear & curiosity? If you boil down every phobia, every fear to its most basic, you have the fear of the unknown. You address the fear of the unknown by making “it” known. That process involves calm reflection and being honest with yourself about what really frightens you, then seeking out the appropriate knowledge and experience. So now when people say: “Oh, I would love to jump, but I’m afraid of heights!” I say, “No one said you had to be unafraid. I'm glad that you talked about skydiving, my dad has given me a gift and it's a ticket for two of skydiving. He wanted me to go out there and try other things, he's always been outgoing and he's teaching me to not be afraid of trying things even if that thing scares me the most. I am so amazed at your story, I truly adore you for being such a risk taker and I think dad is right, I should go out there and be bold by doing unimaginable things I would do! The biggest cause of suffering in the world comes from misplaced anger.